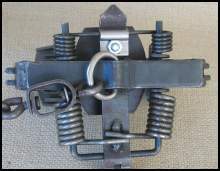 In the early 1970s, I was trapping coyote and I liked using a big trap. I was having leg damage on smaller animals that I wasn't satisfied with – especially the grey fox. I started experimenting with different size metals to apply to the existing jaw to make them thicker. My brother, a metal worker and welder, advised me on the project. We used different techniques – brazing, welding, bolting and riveting – as at that time I was not a welder. This was a definite improvement in reducing foot damage, especially on the smaller animals. I then began offering "Jaw Additions" to my customers. Reduce your fur losses with these flat stock 3/16" x 1/4" and 3/16" x 1/2" jaw additions. More surface holding power to help eliminate twist-outs, pull-outs and, above all, to help eliminate paw and leg damage. These jaw additions are highly recommended for all four-coiled traps. For all jaw orders, please list the trap Brand, Size, Round or Square jaw, and spring measurement. A space is provided for the information beside the Add to Order button. 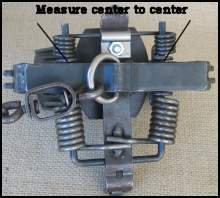 Measure from center to center where the pin comes through the trap frame. If you have questions, please phone or e-mail us. 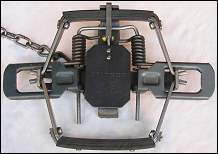 For larger traps: #5 Bridger, CDR, MB750, etc. 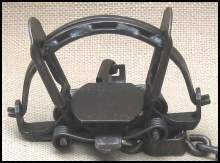 For Large Traps - #5 Bridger, CDR, MB750, etc. For all jaw orders, please list the trap Brand, Size, Round or Square jaw, and spring measurement. A space is provided for the information to the left of Add to Order button. I was doing a lot of custom modifying and working on different traps. The #3 and #4 Montgomerys were prone to bending frames. I wanted a heavier add-on baseplate than the baseplates which were being offered at the time, so I came out with the 3/16" thick notched with O-ring baseplate and I offered end or center hook-up. Later, I added the 3/16" D-ring baseplate. Baseplate #1 - 3/16" x 3/4" base. Fits #1-1/2 Victor, Bridger, Duke, Northwood, Montgomery, Montana Special, Sleepy Creek; plus #1-3/4 Northwood & Sleepy Creek. Baseplate #2 - 3/16" x 3/4" base. Fits #1-3/4 Victor, Bridger & Duke; #2 Victor, Duke & Herter; and #1.65 Bridger. Baseplate #3 - 3/16" x 3/4" base. Fits #2 Bridger & #3 Herter and Cabelas Professional Animal Trap. Baseplate #4 - 3/16" x 1" base. Fits #3 Victor Double Long Spring. Baseplate #5 - 3/16" x 1" base. Fits #2 Montgomery, Bridger & Northwood. Baseplate #6 - 3/16" x 1" base. Fits #3 Montgomery, Montana Special & Sleepy Creek; & #4 Victor Double Long Spring. Full 3/16" thick baseplates to strengthen and keep trap's frame from bending and jaws from popping. Three styles: Notched with O-Ring; D-Ring High Profile; and D-Ring Low Profile. Select Baseplate Number from the drop-menu on the Add to Order button. For all jaw orders, please list the trap Brand, Size, Round or Square jaw, and spring measurement. A space is provided for the information to the left of the Add to Order button. Kit includes: Special tread rubber pad for maximum holding. Pre-drilled 1/8"x3/8" cold roll top strips plus stainless steel hardware with locknuts and instructions. For making your own rubber padded traps using Conner's Rubber Pad Material. 10-Foot Lengths - Available in 3/8" and 1/2" wide. Choose from Center or End Hookup from Add to Order button.